After bringing Ohbijou to an end and maintaining an ongoing gig as the host of CBC's The Doc Project, Casey Mecija released a solo album titled Psychic Materials last year. 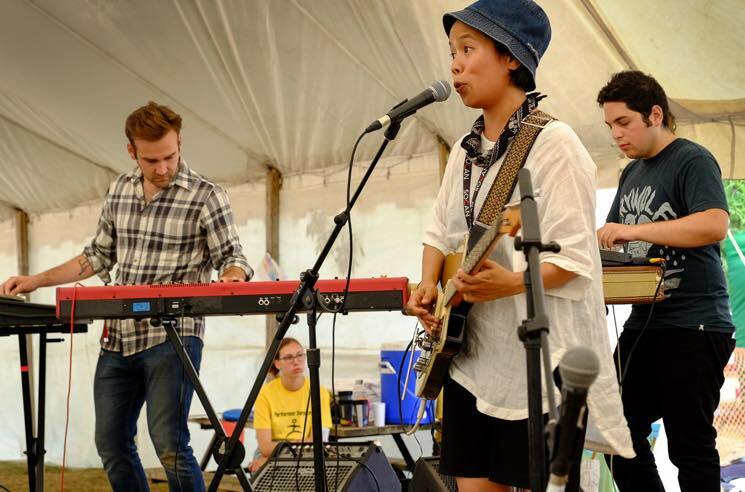 Praising Guelph as a favourite place and Hillside as a favourite festival, Mecija likened the process of making her record to the DIY spirit of the annual weekend event, as she brought the new songs to life for the onlookers at the Island Stage on Sunday afternoon (July 24). Accompanied by a five-piece backing band, Mecija's airy synth-folk songs washed over the lazing, laidback crowd. Dreamy instrumental soundscapes supported the singer-songwriter's enchanting voice, which served as a teller of stories about queerness, diaspora, history and love. She opened with "This War Is More Than Us," then glided through album tracks like "Palms Lose," "We Feel the Same" and "Condo City" — the latter seeing Woodpigeon's Mark Andrew Hamilton join the band on stage for a guest performance. The swirling, stretched out "Sounds That Mark Our Words" was especially gorgeous. Introduced as a tribute to Mecija's parents and the sacrifices they made to build a life in Canada, it translated particularly poignantly live given that the singer's mother was in the audience. Keeping the warm feelings alive amidst the ridiculously hot (but slightly less sunny) weather, Mecija then brought the set to a beautiful close with what she simply described as a "song about love."